Prep your starter to bake with as follows: Feed your mother starter as usual and save the toss off. Take the toss off, feed it 1 cup water and 1 cup flour. Wait 6 - 8 hours and then, without tossing anything away, add another feed consisting of 1/2 cup water and 1/2 cup flour. Bake with this within 4 hours of the last feed. Using the bowl of your standmixer, combine and mix with a spoon until combined. Leave for 20-30 minutes. (Autolyse). Add yeast and salt to the mix and knead for at least 10 minutes on low-medium speed. The dough will gather easily around the dough hook, make a nice slapping sound but will still leave a puddle on the bottom of your bowl. It's a very soft almost satiny dough, very sticky. With a floured hand or the help of a plastic dough scraper tip it into an oiled container with straight sides, and generously dust the top of the dough with flour. It won't shape into a ball but stretch lazily to the sides of the container, flattening out. 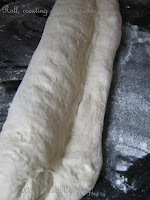 Cover and let ferment for an hour, flour your hand and reach in to pick the dough up, stretch and fold over itself. Quarter turn the container and repeat the motion. Leave to ferment another hour or so, or until doubled. Tip it out on a well floured counter, divide in two equal parts. Make a business letter turn; pat into a rectangle, fold top half almost to the center, bottom half to the center. Fold over itself once. Repeat with the second dough. 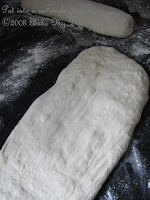 Sprinkle some more flour on your counter and pat the dough into a rectangle. Roll from the longest side inwards, make sure you create surface tension. Repeat with the other dough bundle. This will leave you with two almost baquette shaped logs. 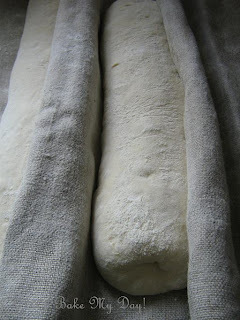 Cover with a clean towel and plastic or transfer to a well floured couche, cover and leave to rise for 45 minutes/1 hour until doubled in bulk. With the help of a metal bench scraper, cut square "rolls", push all the way down through the dough, making clean cuts like I showed in this post, (they are the same rolls with a different dough). The cut edge on the squares will expand and open up, the rolls puff up considerably during baking. Transfer the rolls to a lined baking sheet or your preheated baking stone placing them about 1 inch apart. A part of the rolls were placed cut side up, sprinkled with oregano, some olive oil and olives. 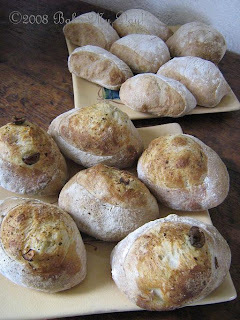 (Which was a great idea until these puffed so much the olives abandoned ship). .
Bake in a preheated oven (425F or 220C) until gold and crusty for about 22-28 minutes. Always check on your dough, given amounts of liquid may vary according to the flour and the viscosity of the starter used. Wat ziet dit er weer heerlijk uit. I love sourdough and these sound and look simply divine. I'm going to have to try making a gluten free version of them. Bravissima!!! Zien er top uit. geweldig zo met die 'meelkant' en de gladde kant. Waren ze niet te zurig? zien er professioneel uit... een bakker in Italië doet het niet beter (die bakken ook vaak met desem). Nou nog maar één printen voor de volgende keer dat de toss er weer off moet. Good job! Nee absoluut niet zurig! Het dikker maken van de toss maakt dat het als een biga ruikt en voelt. Het zorgt voor een beetje taaiige binnenkant en onregelmatig grote gaten. Echt erg lekker! Oef ligt gelukkig niet aan mij? Ik kan het ook al zowat niet zien! Is daar niet iets aan te doen? These look wonderful! I'll have to try. I've got two starters sitting on my counter now and I feel guilty if I just feed them and don't bake with at least one daily. 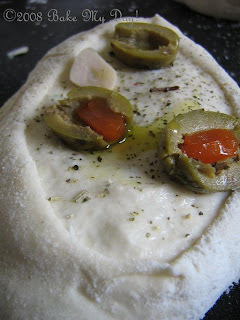 Would it work if you incorporated the olives into the dough as you create the logs? Lynn, I think that's a very wise suggestion! 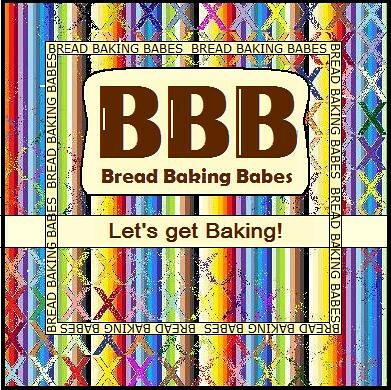 Ellie, I think we are in dire need of a "bakers resort" where bakers all over the world can rent a cottage for a short stay and frolick in the kitchen together! Mmm Mary...I forgot to feed my sleeping starter, let's hope it still has some life in it! It's out on the counter and ready to feed now. Er was wel veel extra bloem nodig om het deeg hanteerbaar te maken. Voor het oprollen heb ik de olijven erop gestrooid zodat ze werden ingesloten door het deeg. Het resultaat was fantastisch. Hoeveel gram is een oz??????????????? Ze zien er zo lekker uit, lijkt me heerlijk voor bij de barbeque.